Muse Ink Press, 9780985991500, 268pp. Sanora Babb experienced pioneer life in a one-room dugout, eye-level with the land that supported, tormented and beguiled her; where her family fought for their lives against drought, crop-failure, starvation, and almost unfathomless loneliness. Learning to read from newspapers that lined the dugout's dirt walls, she grew up to be a journalist, then a writer of unforgettable books about the Great Depression and the Dust Bowl, most notably Whose Names Are Unknown. The author was seven when her parents began to homestead an isolated 320-acre farm on the western plains. She tells the story through her eyes as a sensitive, fearless young girl who came to love the wind, the vastness, the mystery and magic in the ordinary. This evocative memoir of a pioneer childhood on the Great Plains is written with the lyricism and sensitivity that distinguishes all of Sanora Babb's writing. An Owl on Every Post, with its environmental disasters, extreme weather, mortgage foreclosures, and harsh living conditions, resonates as much today as when it first appeared. What this true story of Sanora's prairie childhood reveals best are the values--courage, pride, determination, and love--that allowed her family to prevail over total despair. "On a par stylistically and thematically with Willa Cather's My Antonia, this is a classic that deserves to be rediscovered and cherished for years to come." --Linda Miller, English Professor at Penn State and chairman of the Editorial Advisory Board for The Cambridge Edition of the Letters of Ernest Hemingway. "An unsung masterpiece in the field of American autobiography--I was completely blown away. This memoir offers an unforgettable picture of pioneer life. Her ageless story deserves a permanent place in our nation's literature.--Arnold Rampersad, author of Ralph Ellison: A Biography. 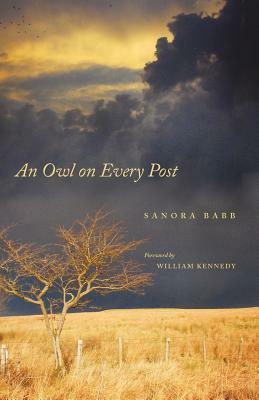 Sanora Babb is the author of five books, as well as numerous essays, short stories, and poems that were published in literary magazines alongside the work of William Saroyan, Ralph Ellison, Katherine Anne Porter, and William Carlos Williams. Her Dust Bowl novel, Whose Names Are Unknown, was recently featured in the Ken Burns documentary on The Dust Bowl. Owl is novelist Babb's memories of her childhood in eastern Colorado and Kansas before World War I. LJ's reviewer found that Babb wrote well, "relating vividly and with fine and fond recollection" Library Journal 12/1/70.